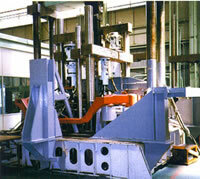 This test system can execute the fatigue test by simulating the real driving condition of the railway bogie. 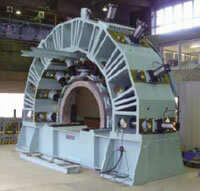 This system applies for studies to analyze the dynamic characteristics of railway coach. This system is used for studies of aerial wires to examine the vibration effect to them and conducting the reliability and endurance test. It simulates dynamical vibration of wires, which is caused during a train pass. The strength of Tunnel Shield can be estimated by exerting multi-forces to one-fifth model in a condition of actual loads.